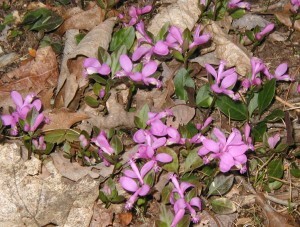 A true Spring Ephemeral can be found now flowering in the woodlands. The trees are leafing in fast now, with only a few oak trees lagging behind the maples and many others that seem to be already in full leaf. Perhaps the leaves will still get bigger, but for the most part anyone would look at the woods and say that the leaves have emerged. Take a walk under the oak trees and look around the leaf litter for blooming spring flowers. If you are lucky you might see the hot pink fairy wings, flowers of Fringed Polygala, Polygala paucifolia. Fairy wings are unique little flowers also known as Gaywings or Flowering Wintergreen. Fairy wings arise from the ground on stems that support both leaves and flowers. The flowers start out as pink buds. 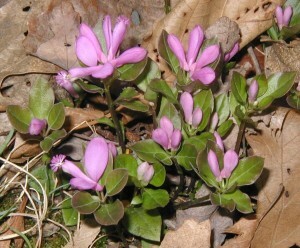 The pink flower buds of early fairy wings, also called gaywings. 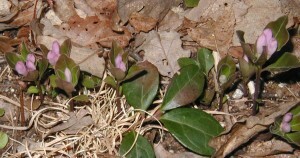 In the photo above, taken 13Apr2010, the central group of the four largest leaves is a wintergreen plant. 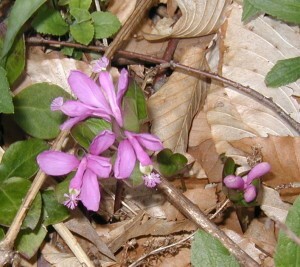 Fairy wings occur in the same habitat as Wintergreen, or Teaberry, Gaultheria procumbens. If only the leaves are present, there may be some confusion as to which plant is which. The bigger leaf with the round end is wintergreen. Its leaves alternate along a stem that is almost flat or prone to the ground. Fairy wings have upright stems and smaller, lighter green leaves that come to a point at the end. Wintergreen often holds on to its red berry, even through winter, and usually has 3-4 oval, leathery, evergreen leaves that may be spotted or mottled with maroon. 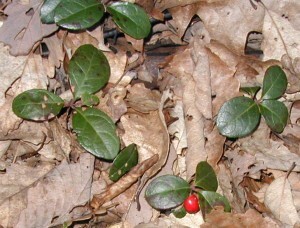 Wintergreen leaves and red berries, also called Teaberry. Red berries and leaves of wintergreen or teaberry. Red berries of wintergreen made it through winter on several plants here. I guess the birds had enough to eat and saved these berries for last. Or maybe they don’t prefer the spicy-minty taste of the teaberry. 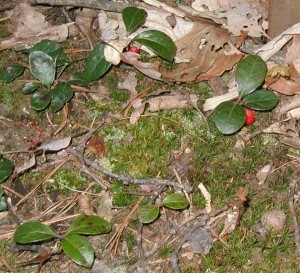 Note that some of the wintergreen leaves are dark green and others are light green with maroon spots. Fairy wings have a more upright stem with leaves smaller than wintergreen and that occur in a whorl around the stem. The leaves of these two woodland plants may confuse the casual onlooker as to their true identity, but the flowers are unmistakable. A fairy wing flower looks like a tiny little pink airplane with a fringed propeller. Two side petals are like the wings of a plane, sticking straight out to either side of the blossom. The center petals are fused into a tubular shape, which makes the fuselage of an imaginary airplane. Fairy wings just opening up their pink petals. Fairy wings in the image above, taken 18Apr2010, were at the far end of the Mill Race Trail at Little Buffalo State Park, Newport, Pennsylvania. The pink petals are still slightly curled at the edges as if the blossoms just then opened. In the woods on our mountain ridge the fairy wings were blooming full on 23 April 2010. Dozens of fairy wing flowers captured our attention with their bright pink petals. The flowers get to show off at the tip of a short vertical stem. The flowering stalks of fairy wings rise up vertically with fringed pink flowers at the tip. 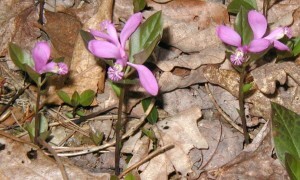 Three or four small oval leaves sit in a whorl right under the flowers. They point upward at the tips so it looks as if they’re meant to cup and protect the fairy wing blossoms. Looking down on a group of fringed polygala blossoms. Closeup of flowers and leaves of fairy wings. You have to be in the woods to get the full impact of these little beauties. Sometimes you’ll see a couple here and there and then a great patch with dozens of flowers blooming in a couple of square feet. 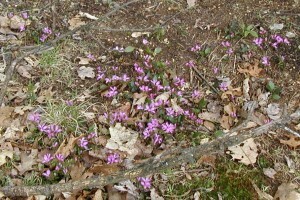 Patch of fairy wings flowering in the woods in April. Fairy wings look stunning among the brown oak leaves on the forest floor. Fairy wings are a lovely woodland plant in eastern North America that blooms in Spring with pretty pink flowers. What were you expecting?